The first time I encountered Rembrandt was at age 8, in a slide show at the Shanghai Children Palace for artistically talented children. The teacher explained the Nightwatch in remarkable detail. His work immediately impressed me, maybe because as one scholar noted: "his work is closer to Chinese painting in technique and feeling than to anything in European art before the twentieth century". Later, my father, fine art editor, gave me a Chinese Art Encyclopedia from 1936 about Western art, including Rembrandt (not too long after the end of the Cultural revolution). I pursued art as a career throughout my childhood, attended the Fine Art universities of Shanghai and Beijing, and developed my own style. It took almost two decades after that first encounter before I saw Rembrandt's work with my own eyes, on a visit to the Rijksmuseum Amsterdam in 1999 with my Dutch fiance, who became my husband one year later. We moved to the Netherlands in 2004, and have our own gallery in Kampen since 2012. With 2019 being the Rembrandt year, I felt that I had to create something special for the occasion. 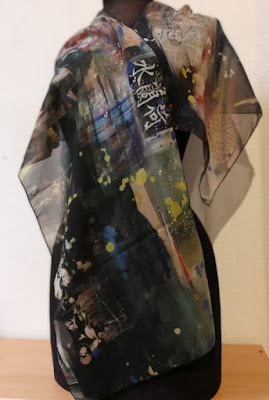 In the end, I decided on an artistic scarf, using my experience with the famous high-end fashion brand "Shanghai Stories": at their request I designed a dozen scarves for the 2010 Shanghai World Expo, which became bestsellers for this company. I created a digital art piece, incorporating the cover of the art book that my father gave me, my father's handwriting on the book's cover, a sample from Rembrandt's Nightwatch, some Chinese phrases, unpublished scarf designs from my past, various personal memories, and samples from a number of my own paintings. A nice detail is the Chinese phrase "He Lan shui", which means Dutch water, a term used in China for carbonated beverages - and a hint at Rembrandt's family name, van Rijn (the Rhine river). The resulting piece "Remembrandt" was printed on silk, making a 135x31cm scarf that is displayed on a vintage mannequin model.